As a seasoned exhibitor at the Showman’s Show, Visions had another fantastic year promoting its five successful divisions: Technical Production, Power Distribution and Generators, Large Format Print, Infrastructure Management and Media Design. Chris, Mark, Sarah and Clair met with many familiar faces and potential new customers from across all sectors of the outdoor event industry over the two days. Visitors to the stand were able to enjoy a hog roast whilst catching up with the team. Showcased for the first time were new small and compact MDPE 125amp 3-phase inline protection distros complete with variable earth leakage relays. It also displayed examples of its increased stock level range of powerlock and 63A 3 phase distribution boards that have proven popular during the busy summer season. Jamie and Colin, technical experts were on hand offering advice on power solutions and the expanded dry hire service. With the recent acquisition of RS Power, Visions has increased stock levels and product range to suit the requirements of both the production and dry hire market. 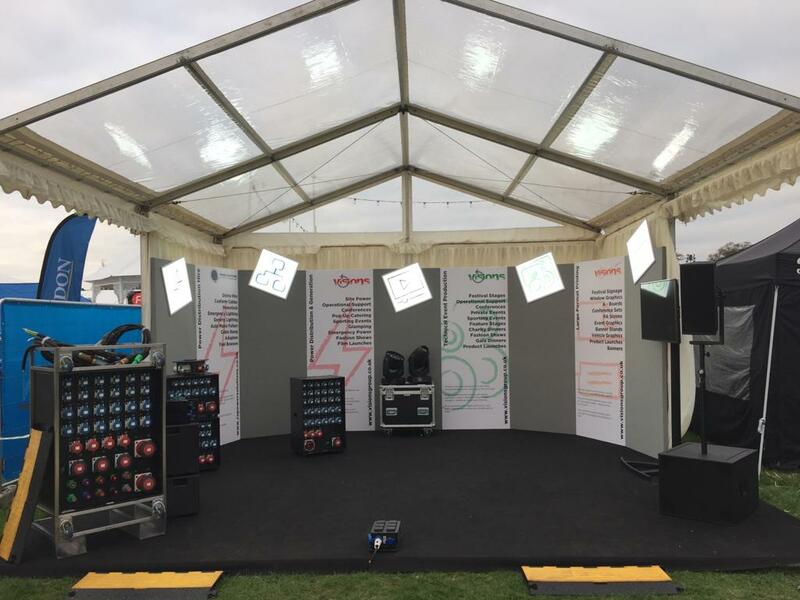 Visions has been supplying the events industry with a variety of products since 1999 and are set to become one of the fastest growing production companies this year. With the opening of a new depot in Manchester it puts the business firmly on the map for working at events in the North West and surrounding areas.